A ring bearer pail for beach wedding ceremonies can be an adorable alternative to a standard ring bearer pillow. You can also coordinate the pail into your beach wedding theme in a variety of ways to add a touch of whimsical fun to the momentous occasion. Although you may not find an item specifically designed for use by a ring bearer, rest assured you have plenty of options in finding just the right accompaniment for this member of the bridal party. 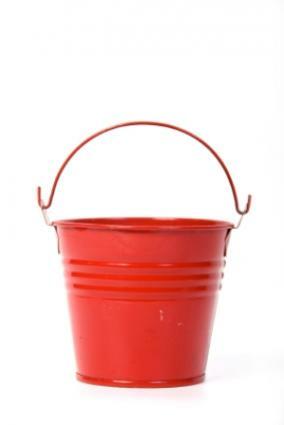 You can purchase pails from a wide number of venues, including craft, department, discount, and party and favor stores.The following are a few aspects you may want to take into consideration in finding just the right pail. The size of the pail can be small or large, depending on preference and the ring bearer's age. A small, light, mini-pail might be preferable for a younger ring bearer, while a child a bit older may be able to handle a larger pail that is showier. If the ring bearer will actually be carrying the rings, a small or medium pillow for larger pails may be used to keep the rings accessible. For miniature pails, the rings can be secure to the bottom of the pail or to a tiny pillow and still be easily accessible. Pails come in virtually every color of the rainbow, from brilliant primary and neon hues to soft, romantic pastels. If you have several colors in your wedding scheme, you may choose to have the pail reflect a specific color in the flower arrangements, to match the favors, or to match the bridesmaids' gowns and attendants clothing. The material the pail is also a consideration. A bright standard or mini-size plastic beach pail might be perfect for an informal wedding, or you may prefer a galvanized metal pail for a rustic or romantic feel. A vintage-style pail can be perfect for a traditional or theme wedding. A plain or painted design can add an air of sophistication to this fun wedding accessory. As opposed to an ornate ring bearer pillow, the cost for a ring bearer pail can be very affordable. A simple plastic mini pail may be less than one dollar, while vintage or specialty pails can cost more.For a coordinated look, use mini beach pails filled with small candies, candles, or other items as wedding favors, and have your ring bearer use one of the adorable matching pails. Toy Connection sells mini, brightly colored plastic pails. 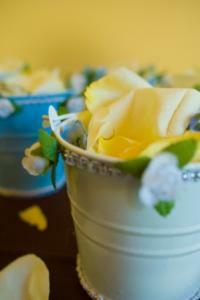 Bliss Weddings has mini aluminum pails available that can be used alone or dressed up for a custom look. Beau Coup's hand painted beach pails are designed as keepsake boxes, but their exquisite details would make them an interesting focal point for carrying the rings. They are delicate and made of fine porcelain, so may only be suitable for older ring bearers. A traditional lightweight beach pail from My Bambino, although designed for children, is customizable, so you can put you and your spouse's names on the pail for a personalized touch. 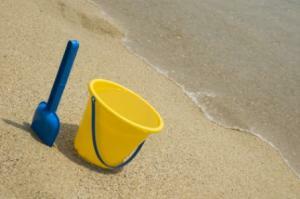 If you choose a customized or detailed pail, you may not want further decoration. If you choose a plain pail, however, you can dress it up in a variety of ways. Glue sea shells or other small beach related decor items to the pail itself, or use a combination of wedding and beach symbols for a mixed blend of décor. Decorate the handle with a few flowers and greenery to match the wedding flowers, or allow a matching shovel to dangle from the handle. Wrap coordinating ribbon and tie a simple bow for an elegant but simple addition to the pail.You may choose to allow the ring bearer to keep the pail and shovel as a gift, or fill an identical pail with beach toys, small gifts, or treats to give the young man a gift for his effort on the special day. Whether you choose the simplicity of a colorful pail or choose to add additional décor, a ring bearer pail for beach wedding ceremonies can be one more idea that adds to the memories of your special day.